MILBERT - Rapids on the Hudson at Adley's. . . N°28. Pl. 4. MILBERT, J. - Rapids on the Hudson at Adley's. . . N°28. Pl. 4. Rapids on the Hudson at Adley's. . . N°28. Pl. 4. - MILBERT, J. Title : Rapids on the Hudson at Adley's. . . N°28. Pl. 4..
Map maker : MILBERT, J.. Date : Paris, E. Ardit, 1829. Size : 9.6 x 11.8 inches. / 24.3 x 30.0 cm. 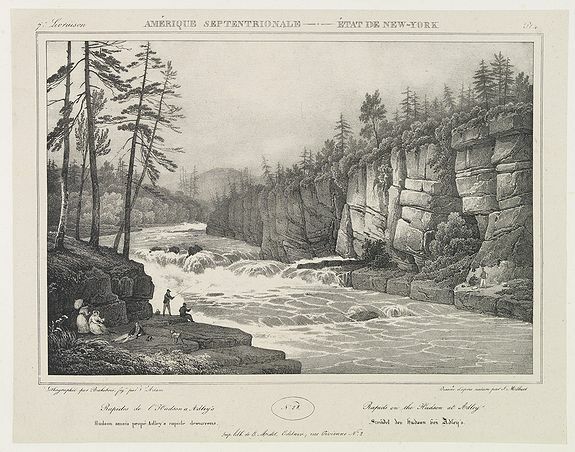 Description :A view of the rapids on the Hudson River at Adley's. From 7e Livraison Amérique Septentrionale - Etat de New York. After Jacques Milbert and lithographed by Bichebois, the figures by V. Adam. Printed by E. Ardit rue Vivienne N°2. An outstanding view from Milbert's Itinéraire pittoresque du fleuve Hudson et des parties latérales de l'Amérique du Nord. Milbert arrived in the United States in 1815, with the backing of the Museum of Natural History in Paris, with instructions to explore, record and collect as much information about the topography, social history, and flora and fauna of the north east of the country as possible. The task took him seven years, and in addition to the 8,000 natural history specimens he sent back to France, he made a series of highly significant sketches of the areas through which he traveled. The present image, an important early example of the use of lithography for topographical prints, is part of this eye-witness record of life in America in the early 19th century which forms the most comprehensive and accurate depiction of the country at the time. As an artist, Milbert loved to paint American landscapes, particularly those that showed the Hudson, "King of Rivers", flowing majestically through the mountains? the pictures of what he saw, as of the time he drew them, constitute a unique and valuable record' (Sherman, A French Explorer in the Hudson Valley). Deak p.299, Howes M-592, Ray French 110, Sabin 48916. Condition : Lithograph printed on China paper and pressed onto wove paper. Good and dark impression.